Any time, day or night, we'll be there to help get your heat or A/C back into shape. 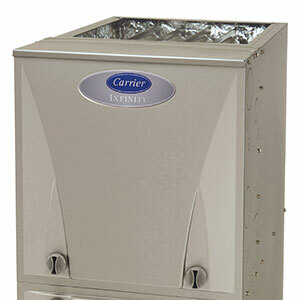 We are a full-service A/C provider, offer installation, maintenance & repair. Why Siemer Heating & Cooling? With Siemer Heating & Cooling, you’ll get high-quality work, state-of-the-art products and impeccable customer service. We’re a trusted residential and commercial HVAC company because we work very hard to keep our customers happy and comfortable. 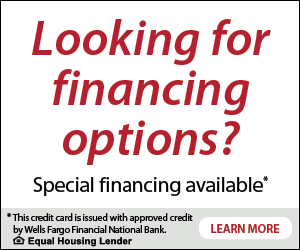 We offer affordable pricing, regular specials and special financing with approved credit, so you’ll always have access to essential HVAC products and services. We also provide emergency heating and cooling service 24 hours a day, 365 days a year and a free written estimate for all our work. 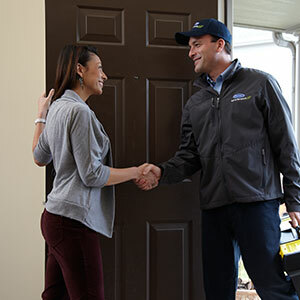 Whether you need a furnace upgrade, an emergency heater repair or annual air conditioner maintenance, our 100 percent satisfaction guarantee means you’ll never be disappointed. Siemer Heating & Cooling is a Carrier Factory Authorized Dealer, and we employ highly-trained and exceptionally-skilled NATE-Certified technicians. We’re licensed, bonded and insured for your protection, and we bring more than 30 years of HVAC industry experience to the table. Contact our staff during regular business hours for heating and air conditioning service, schedule a routine appointment online or call us any time you need emergency heating and air conditioning repair. When you need residential or commercial heating and air conditioning services, the professionals at Siemer Heating & Cooling have knowledge and expertise you can count on. For over thirty years, Siemer Heating & Cooling has continued to meet the highest standards in customer dedication. 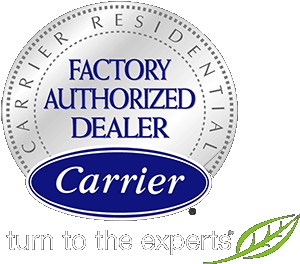 We are a Carrier Factory Authorized Dealer, consistently and continually living up to strict qualifications in all aspects of service. As a Carrier President’s Award winner, we have been recognized for leadership in business, technical expertise, and going above and beyond to exemplify customer care. Our team is entirely NATE-certified, having verified extensive industry knowledge through national core and specialty exams. We hire only the most qualified people, and all of our technicians are background checked, drug-screened, fully licensed and insured. Siemer Heating & Cooling offers a wide range of services including heating and cooling installation, maintenance and repair. We strive to answer of all of your needs, devoting the full extent of our resources and experience into providing a rewarding completion of any project we undertake. We specialize in central air conditioning, furnaces, boilers, heat pumps and Indoor Air Quality Solutions. Our dedicated technicians are on call 24 hours a day, 7 days a week to bring you the help you need in emergency situations. To take the best possible care of your HVAC equipment and your interests, we provide free written estimates for all work and offer customized maintenance plans. Through accurate and precise installation, preventative service, and lasting repairs, we protect your investment in home comfort and strive to ensure maximum efficiency, safety, and uninterrupted comfort. For personalized attention and superior workmanship in both residential and commercial application, call Siemer Heating & Cooling. We keep the Highland area weather outside, and ensure a comfortable, healthy home for you to enjoy. Since we’ve been in business, we have proven our commitment to our customers and to quality work time and time again. Our goal is to do the job right the first time. Our track record is backed by accreditations from Angie’s List and the Better Business Bureau and accolades such as the 2010 Carrier President’s Award. When you need residential or commercial heating and air conditioning services, the professionals at Siemer Heating & Cooling have knowledge and expertise you can count on. As a Carrier Factory Authorized Dealer, we’re committed to exceptional products, outstanding services and competitive prices. For our NATE-Certified technicians, every job is equally important, whether it’s a minor home heating repair or the design and installation of a new commercial HVAC system. If you have questions about any of our services, please call us. We’re always here to help. If your heating and cooling equipment isn’t performing properly or has stopped working altogether, Siemer can help. Our technicians can also perform repairs on any make or model of heating and cooling equipment and stock their trucks with quality parts need for most repairs. Thanks to our afterhours hotline and 24/7 emergency services, you and your family don’t have to go without effective heating, cooling or power for long. When repairs are no longer worth it, the professionals at Siemer can help you choose energy-efficient replacements that will slash your energy costs and provide superior comfort all year long. As expert home and commercial HVAC contractors, we are dedicated to diagnosing problems and performing repairs or replacements promptly. When you call Siemer Heating & Cooling for residential or commercial HVAC services, you can expect prompt attention, competitive prices and professional service. We work for you, and we’re committed to your peace of mind. Siemer Heating and Cooling provides dependable commercial and residential heating and cooling installation and repairs throughout Northwest Indiana and South Chicagoland. We also sell, install and service dependable residential electric generators. When you need professional heating and cooling installation or repair, call Siemer Heating and Cooling to schedule service. Heating and cooling systems are a vital part of daily life. We rely on our heating and cooling systems for indoor comfort year-round, so it pays to have some basic heating and air conditioning information at your disposal. With a bit of knowledge, you can prevent many HVAC problems from developing, keep energy costs as low as possible and take preventive action when problems occur. Many common air conditioning problems and heater problems result from poor HVAC maintenance. At Siemer Heating & Cooling, one of the most helpful tips we offer is that air conditioners should be serviced every spring and heat pumps/furnaces should be serviced every fall. Preventive maintenance will extend the life of your HVAC equipment, help it to function efficiently and reduce the potential for costly breakdowns and repairs. You can do your part to maintain heating and cooling equipment by keeping the air filters clean. Most filters should be cleaned or replaced monthly, especially if you have pets. Clean filters reduce airborne pollutants, keep HVAC equipment from overheating and help the system to function efficiently. If you have a heat pump, furnace or air conditioner that’s over ten years old and needs frequent repairs, consider upgrading to a new, high-efficiency system. Heating and cooling systems get more efficient every year, so the older your system, the more you will save on energy bills with a replacement. The monthly savings can be enough to offset installation costs over time. Read our blog for more HVAC tips and money-saving tricks.